Further’s engine compartment on a glorious Sunday afternoon. The primary fuel filter goes in that mount on the right side of the compartment. What did you do this weekend? 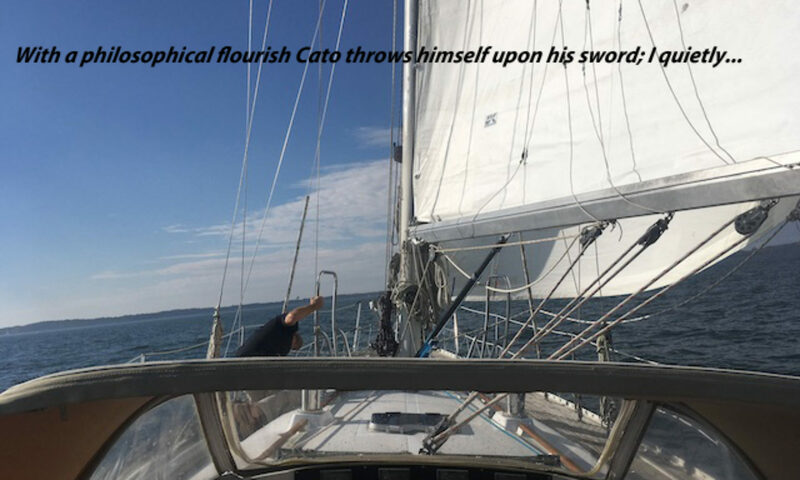 If you’re a sailor on the Chesapeake Bay, hopefully you spent yesterday — a truly glorious spring Sunday — on your boat in the gorgeous sunshine and steady, building breeze. Me, I spent my Sunday with my head in Further‘s engine compartment. Last Sunday, I took Further out but never left Back Creek. I backed the boat out of her slip, spun her around and motored a little way into the creek toward the Annapolis Landing Marina fuel dock. I didn’t stop, just asked the attendant how late they were open. I planned to fuel up at the end of my day. Turns out the end of my day was about three minutes later. I revved up Further‘s diesel to pull away from the fuel dock but a few seconds later the RPMs just dropped inexplicable. I pulled the throttle back for a couple of seconds and then opened it up again. Motored along…okay, all fine. Nope, there’s that drop again. So rather than run into a problem out on the bay, I returned to my slip and shut everything down. I then pulled the stairs out so I could get at the engine. 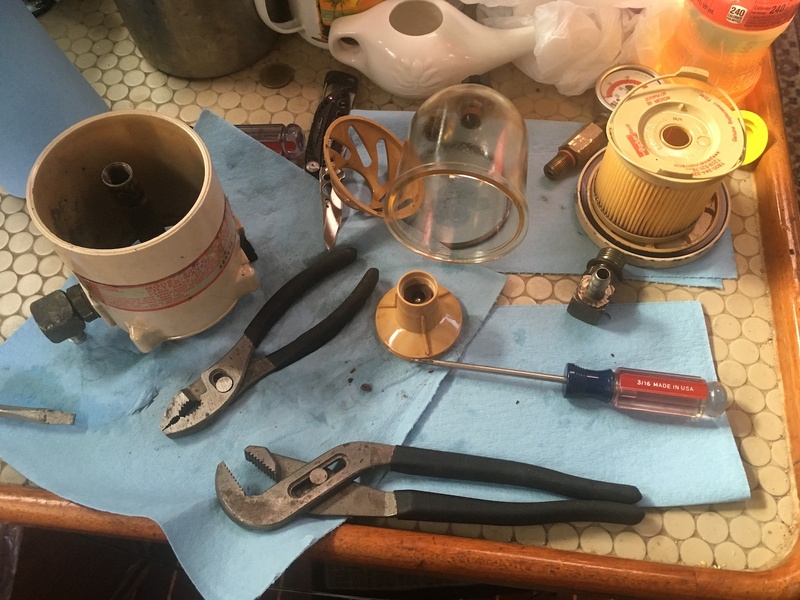 And when I fired it up again, I found that the vacuum gauge on top of the primary fuel filter was way up into the red — and with it went my planned-for Sunday on the bay. Now, I am not mechanically inclined. I’d like to be and I’ve tried, somewhat, to learn to be capable when it comes to engines. In the interest of sailing self-sufficiency, a couple of years ago I took a two-day course at the Annapolis School of Seamanship on diesel engines — you know, the kind of engine in a sailboat. In hindsight, I should have waited until after I’d bought Further, that way after each class I could have returned home and cross-referenced what I’d learned in the class to my engine. Instead, a couple of years removed from the class, I have to dredge up memories of the class and pull out some reference books and see if I can figure out what’s what. 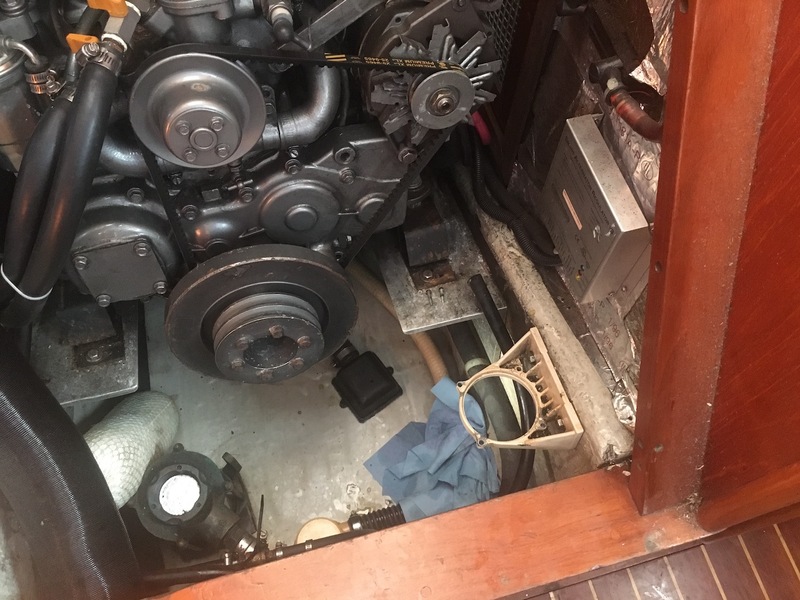 I have to take on faith the dictum of Nigel Calder, author and guru of DIY yachties the world over, that diesel engines are eminently logical, and that if one just follows the logic one can solve any problem. Thus far, I hadn’t had anything too pressing on my engine. I’ve checked the oil, I’ve changed the element in the fuel filter..that’s about it. But now we’re into something more. Okay, so, the symptom is: the vacuum in the fuel line is high. That means the fuel pump is pulling too hard. That means something is obstructing the flow of fuel. That means something is clogging the fuel line. Logical, right? After work on Wednesday, I dug into it some more. I disconnected the fuel line between the tank and the filter and made sure it was clear. How did I do that, you ask? I blew on the end of the line that connects to the tank. Mmm, that diesel sure is yummy! Meanwhile, back in the engine compartment, fuel flew all over the place, thereby proving the line wasn’t blocked. In the process, I got so stinky with diesel that when I walked into the locker room to play hockey that night, a friend turned to me and said, “Jesus! You smell like diesel!” I wasn’t high from the fumes but I sure wasn’t right. Of course, in the process of getting the fuel line off the fittings on the fuel filter, I wound up damaging so end of the hose. So on Thursday I went to the local chandlery and got a new length of fuel line. Thursday evening I connected it up and tried the engine. Better still, but also still in the yellow. Not there yet. So yesterday, on that glorious Sunday I referred to earlier, I dug in. I filled the fuel filter with clean diesel, right to the top, and ran the engine for a bit. The gauge was again in the yellow. And when I opened the filter again, the chamber was half-full of fuel. That tells me that yes, the fuel pump is sucking hard and fuel isn’t getting into the filter. So if it’s not the fuel line from the tank and it’s not beyond the filter, it must be the filter itself, right? Here’s the Racor fuel filter, exploded onto the countertop in the galley. Fun! Next step: I took apart the filter itself and cleaned all sorts of gunk out of the centrifuge that separates water and crap out of the fuel. That was a project but it was pretty straightforward, thanks to a good online resource. Filled the filter back up and started the engine. Even better: the gauge went up into the yellow and then came back down a bit. Still in the yellow but better, noticeably better. And to be honest, I was pretty proud of myself for having given it a shot and having helped the cause in the process. But still not good enough. All this started because on Tuesday I had stopped by a local marine-engine shop that a hockey-playing friend had recommended. “Chris eats Yanmars [my brand of engine] for breakfast,” Jay declared. In typical Annapolis fashion, Chris said he could take a look…in May. He did concur with my belief that it was something in the fuel line between the tank and the filter, especially when I said that there were some air bubbles visible in the filter. But May?! That’s six freakin’ weeks away! Oy. So after all my efforts, today on the way into work I stopped by another engine shop. They’re making appointments in mid-April. In the meantime, I’ll keep trying to fix things on my own (including another bit of advice from that online resource) and hopefully get it sorted out before I need help from the pros. Because being able to DIY is not only a safer, cheaper way to live the boating life, it’s also really gratifying. Even if it does cost you a gorgeous day on the bay.